With the 25mm Anti Skid top, the Butterfly Europe is the prefect table for major tournaments and for specialist clubs where the tables stay in place. 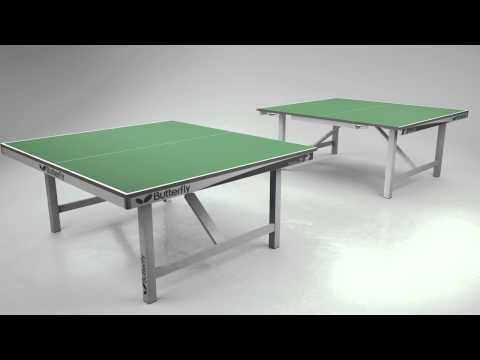 Used for most major Championships in the British Isles..
Top quality table for indoor use in sports centres and for match play at club, league and tournament level. With ‘Anti-Skid’ it’s the perfect table for major tournaments and for specialist clubs where the table stays in the play position. Two 8” wheels on each half for easy movement. The Butterfly Europa 25 is also used by many leading clubs including Drumchapel Glasgow. The special surface increases the consistency and reliability of the bounce to accommodate against both topspin and chop. It reduces the skid and gives you more confidence to play your shots.